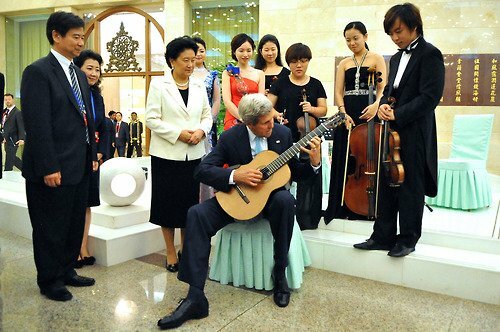 US Secretary of State John Kerry played a musician’s guitar following a lunch at the Great Hall of the People in Beijing, China. John Kerry and Chinese Vice-PM Liu Yandong co-chaired the fifth annual US-China High-Level Consultation on People-to-People Exchange (CPE). The CPE aims to enhance and strengthen ties between the citizens of the United States and China and has done so over the past four years in the areas of culture, education, science and technology, sports, and women’s issues. This year, the two sides agreed to add a sixth area of people-to-people exchange: health.